UPDATE: This post was updated on 8 March 2017. A further 17 studies were added to the bibliography, with each clearly marked as “NEW“. You can navigate to the beginning of the new content here. This post is part of a wider series on Women in Academia and coincides with LSE Women: making history – a campaign in celebration of #LSEwomen past, present and future. The often unconscious and unintentional biases against women, including in academe, have been well documented in the autobiographical writings of authors such as Audre Lorde, Adrienne Rich, Patricia Williams, and bell hooks. But is the experience they document merely “subjective”? Several recent social science research studies, using strictly controlled methodologies, suggest that these first-person accounts of discrimination are representative, not simply anecdotal. While some studies suggest that some fields are making a concerted effort to reverse gender imbalance in hiring and other practices, the majority of these studies reveal a consistent and continuing range of biases at each stage of the hiring, tenuring, and promotion process as well as in peer review and teaching evaluation. The studies aggregated and summarized below offer important policy implications for the traditional ways that we quantify the processes leading to hiring, promotion, and tenure. You cannot simply count “outputs” in making an evaluation of someone’s worth and reputation if there is a “biased filter” at the first stage of evaluation, prejudicing judgment at the outset. We include here a round-up of several of these recent studies. There is also an open, public Google Doc to which we invite others to add other relevant studies and responsible, careful, fact-checked annotations. Before listing the studies, we would like to offer a number of talking points about what they, in aggregate, suggest. In these studies, actors believe, often quite earnestly, that they are making choices or judgments based entirely on the basis of “quality” or “excellence” or “expertise.” However, several of the studies reveal that changing only the gender identification of the person being judged radically and consistently alters the way others evaluate the quality of that person’s work. Work by people assumed to be men—as students, as colleagues, as authors, as experts—is consistently judged to be superior to that by people assumed to be women—even when the only difference in is the author’s gender-specific name. Women are as likely as men to make biased judgments that favor men. Culture and representations play an important role in perpetuating gender bias within and beyond academe. Cultural factors are not just of concern to humanists but also have a direct impact on perception more globally—they are variables that social scientists and natural scientists must attend to. A study that appeared in proceedings of the National Academy of Sciences acknowledged that gender biases stem “from repeated exposure to pervasive cultural stereotypes that portray women as less competent but simultaneously emphasize their warmth and likeability compared with men” (Moss-Racusin et al., 2012). The implications of these studies are relevant to both broad and discipline-specific trends. This is important given how different disciplines often have seemingly unique protocols for hiring, tenure, and promotion. Gender bias seems pervasive, even when the forms, methods, and metrics vary by discipline. Humanists—whether in women and gender studies, science studies, or education studies—need to attend to these quantitative studies, help students learn to interpret and deploy them, and perhaps even suggest further areas for empirical study. They provide convincing evidence to support many theoretical arguments (and vice versa). Studies of the hard data of gender bias—in an era of hard data—should be required reading of all administrators and all faculty who are called upon to make decisions about hiring, tenure, and promotion based on purely quantitative measures such as “productivity” or “citation counts.” An adage of data scientists is “garbage in, garbage out.” That means if the sample or the data is corrupt or biased when it is first entered, then any conclusions based on mining or crunching that data must be regarded with keen skepticism. You cannot simply count the end product (such as number of articles accepted, reviewed, awarded prizes, or cited) without understanding the implicit bias that pervades the original selection process and all the subsequent choices on the way to such rewards. Given the important findings in that groundbreaking study of racism, one wishes these gender studies had also found a way to account for racial discrimination too. To see the parallel role of race and racial discrimination—and the particular discriminations that happen to women of color in the academy—we highly recommend the volume by Gabriella Gutiérrez y Muhs, Yolanda Flores Niemann, Carmen G. González, and Angela P. Harris,Presumed Incompetent: The Intersections of Race and Class for Women in Academia (Utah State University Press, 2012). 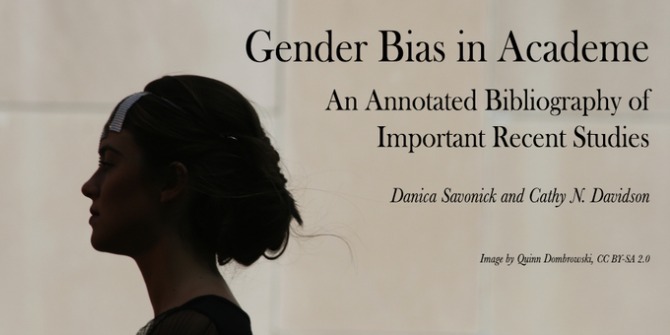 The pieces in this book form a crucial intervention in the study of gender bias, focusing on the combined biases faced by women of color in academe (see annotation below). In addition, we need to attend to research that analyzes the experiences of the non-normatively gendered within academe. We need conscious efforts to counteract unconscious and unintentional biases based on gender, race, ethnicity, class, sexuality, and (dis)ability. This study by Vanessa Lynn Ewing, Arthur A. Stukas Jr., and Eugene P. Sheehan used an “attributional ambiguity paradigm” to compare student reactions to lectures when students did not know the sexual orientation of the speaker and when the speaker was identified as gay or lesbian. When the lecture delivered was “weak,” participants actually rated the gay and lesbian lecturers more highly, which the authors suggest may be an effort to avoid discrimination. However, when the lecture was “strong,” participants rated known gay and lesbian lecturers more negatively than the lecturers whose sexual orientations were not known. According to the authors, these findings suggest how biases and prejudices based on sexual orientation may affect perceptions of “merit, skill, or likeability,” which often weigh heavily in hiring decisions. This study by Reshma Jagsi and Elizabeth A. Guancial et al. analyzes original articles from six prominent medical journals over the past four decades to explore the disparities among men and women in academic medical publishing. They found that although the proportion of women authors of original research has increased, women still compose a minority of the authors of original research and guest editorials. In the UK, only 12% of third year female PhD students in chemistry want to pursue a career in academe, compared to 21% of men. This report prepared by Jessica Lober Newsome analyzes why women in chemistry PhD programs often choose not to pursue academic careers in research beyond their PhD. Female participants in the study described the obstacles they faced in doctoral study including lack of mentorship, feelings of isolation and exclusion (particularly within research groups), discomfort with the masculinist culture of research groups, and apprehensions that poor (though statistically average) experimental success rates would reflect negatively on their competence. In addition to these experiences during doctoral programs, female participants in the study chose not to pursue careers in science research because they understood these careers to be “too all- consuming, too solitary and not sufficiently collaborative,” incompatible with their relationship and family goals, demanding of sacrifices (related to femininity and motherhood), and already biased against women. The study includes policy recommendations such as incentivizing and rewarding programs that promote gender equity; developing networks of mentorship, contact, and support; creating more supportive cultures; training supervisors to incorporate diversity and equity; recognizing and funding support given by postdoctoral fellows; asking women role models to share best practices; and incorporating classes on gender equity, including at research conferences. This randomized, double-blind study by Corrine A. Moss-Racusin, John F. Dovidio, Victoria L. Brescoli, Mark J. Graham, and Jo Handelsman found that both male and female faculty exhibited a bias against female undergraduate students, evaluating them as less competent, hirable, and qualified, and offering them less funding and mentorship. Based on application materials, a candidate for a laboratory manager position was deemed more competent, qualified, and hirable if they had a male name. Identical application materials submitted under a female name were judged as less qualified. In addition, the faculty hiring committee selected a higher starting salary and offered more mentorship to selected male applicants. Gender bias was found in both male and female faculty. The authors of the study acknowledge that bias is often implicit or unintentional, “stemming from repeated exposure to pervasive cultural stereotypes that portray women as less competent but simultaneously emphasize their warmth and likability compared with men.” The authors cite research findings that those in disciplines that value objectivity are particularly susceptible to subtle gender biases because they are not on guard against them. Indeed, these negative biases against female undergraduates may affect their career decisions and whether they see doctoral studies in the sciences as a viable option. Gabriella Gutiérrez y Muhs, Yolanda Flores Niemann, Carmen G. Gonzalez, and Angela P. Harris, eds. Presumed Incompetent: The Intersections of Race and Class for Women in Academia. Boulder: University Press of Colorado, 2012. The essays in Presumed Incompetent interpret and contextualize many studies of the additional obstacles faced by women of color in academe including the presumption of incompetence (perpetuated by a lack of role models, leaders, and mentors), covert and overt racism, conscious and unconscious bias, extra work, tokenism, having to battle stereotypes like the “mammy,” racist and sexist teaching evaluations, and the presumption of self-interest rather than expertise when teaching about oppression. This study of women researchers in Canada found that despite the increasing proportion of women in academe, “significant disparities [are] still present by rank and discipline.” More specifically, they found that as academic rank increases so too does the percentage of men in comparison to women. The report also includes strategies for attracting and retaining women researchers such as increasing mentorship opportunities, scholarships, targeted grants; creating more flexible and family-friendly environments, including on-campus child-care services; instituting government-legislated policies that address systemic issues such as legislated quotas, employment equity policies, and grants to accommodate parental leave; and undertaking legal action to redress inequalities and injustices. Mason, Mary Ann, Nicholas H. Wolfinger and Marc Goulden. Do Babies Matter? : Gender and Family in the Ivory Tower. New Brunswick: Rutgers University Press, 2013. This book explores the role of family formation in discouraging women from pursuing graduate degrees and becoming faculty members in the sciences. It addresses issues like the dearth of female role models and “the baby penalty,” (how women with children are far less likely to receive tenure than childless women or men with or without children). The authors include recommendations for addressing these inequalities such as entitlements, rather than special accommodations, like tenure-clock stoppage and parental leave, that are available to both men and women. Read more, including recommendations for greater gender equity, in Nicholas H. Wolfinger’s article “For Female Scientists, There’s No Good Time to Have Children” in The Atlantic here. Note: The Matilda effect, coined in 1993 by Margaret W. Rossier, names the systematic denial of contributions by women in the sciences. Their work is often attributed to male colleagues. In this study, authors Silvia Knobloch-Westerwick and Carroll J. Glynn performed a citation analysis of 1,021 articles published in Communication Research and the Journal of Communication between 1991 and 2005. They found that articles authored by female communication scientists received fewer citations than articles authored by males. This study by Jevin D. West et al. uses data from JSTOR to analyze the gender gap in scholarly publishing, exploring interpretations that range from gender bias to women’s disproportionally greater time commitments to the roles of teaching and committee work. The authors looked at more than 8 million papers across the natural sciences, social sciences, and humanities, revealing persistent gender inequities across the disciplines. For instance, they found that the percentage of female authors is much lower than the percentage of women in full-time faculty positions. They also found that women are significantly underrepresented as authors of single-authored papers and that men predominate in the prestigious first and last author positions. In the sciences, the order in which authors’ names appear is crucial for tenure and promotion, though women are often less confident and assertive when negotiating where their names will appear. When women speak up for themselves, they are often perceived as mean, pushy, and unfeminine. Read more at Eigenfactor.org here. Using data from the Teaching, Research, and International Policy project on peer-reviewed publications between 1980 and 2006, the authors of this study, Daniel Maliniak, Ryan Powers, and Barbara F. Walter found that “women are systematically cited less than men” after controlling for many substantive variables. They suggest that this gap may be due to several factors including the disproportionate number of male scholars in the field and the fact that women tend to cite themselves less than men. This has important hiring, promotion, and tenure implications because citation counts often function as a key metric in determining the quality and impact of a scholar’s research. In this study, authors Silvia Knobloch-Westerwick, Carroll J. Glynn, and Michael Huge asked graduate students in communications programs across the country to evaluate conference abstracts, and found that students gave higher ratings to identical abstracts submitted with male author names, associating them with greater “scientific quality.” Female-authored abstracts on topics such as “parenting” and “body image” (rather than “politics”) were perceived as gender-appropriate and rated more highly than abstracts on gender-neutral research topics. Male-authored abstracts that related to topics deemed “masculine” such as communication and political participation or democracy and journalism (as opposed to studies of gender, infancy, and parenting) were judged to have the greatest “scientific quality.” Graduate student evaluators were also most enthusiastic about potentially collaborating with the male authors of abstracts on “masculine” topics. The authors demonstrate how even small degrees of gender bias can accumulate over the course of an academic career, affecting grant proposals, promotion and tenure reviews, and hiring decisions. In this report, Joan C. Williams, Katherine W. Phillips, and Erika V. Hall revisit and build upon the classic 1976 study, “The Double Bind: The Price of Being a Minority Woman in Science.” Their study finds that the four most common practices of gender biases in the sciences are: 1) women have to provide more evidence than men in order to be seen as equally competent; 2) women are caught between the perceptions that science requires masculine qualities and the cultural imperative to appear feminine; 3) “the maternal wall”: the assumption that women lose their competence and commitment after they have children; 4) the fact that women as well as men can be biased against women in masculine work environments. These conditions are exacerbated in STEM environments, practitioners of which often view their disciplines and practices as highly meritocratic. In addition, the dearth of women in STEM fields exacerbates the pernicious effects of tokenism. The report details how these biases function in different ways in relation to black, Asian-American, and Latina women, and how their experiences of bias in fact exceed the limits of these four categories. The report concludes with a list of best practices to implement when recruiting hiring, promoting, and tenuring women of color scientists. This study found that when letters of interest were sent to professors in different disciplines (business, education, life sciences, humanities, social sciences, fine arts, etc. ), the responsiveness of faculty varied according to race and gender. In all fields but the fine arts, letters signed with names that tend to be associated with white men (Brad Anderson as opposed to Keisha Thomas, Raj Singh, Mei Chen, or Juanita Martinez) were more likely to receive a response from a faculty member. Among business professors, where the disparities were the most extreme, responses to letters signed with names associated with white men increased 25 percentage points as compared to letters signed with names that signified females or males from underrepresented minorities (87% compared to 62%). This article describes an online tool recently developed by Professor Benjamin Schmidt that allows users to analyze the teacher evaluations posted to RateMyProfessor.com based on the instructor’s gender. Users can type in keywords and see the frequency with which they are used to describe female instructors in comparison to male. As author Laura Bates notes, the results indicate that gender biases pervade teaching evaluations: men are more likely to be described as “brilliant,” “intelligent,” and “smart” while women are described as “mean,” “harsh,” “unfair,” “strict,” and “annoying.” Many of these adjectives suggest that female instructors are judged by how closely they measure up to cultural stereotypes of women as kind, friendly, caring, and nurturing mothers—parental criteria that do not get applied to men. However, she also notes that “there is less focus on female professors’ looks than one might anticipate.” These results should be taken seriously given the influence of teaching evaluations on academic hiring, promotion, and tenure decisions. In a paper recently delivered at the American Sociological Association Annual Meeting in 2015, Molly M. King, Shelley Jo. Correll, Jennifer Jacquet, Carl T. Bergstrom, and Jevin D. West found that “in almost all academic fields, men cite their own research papers at a higher rate than women do.” The authors analyzed a dataset of 1.6 million papers in the scholarly database JSTOR and found that 31% of men and only 21% of women engage in self-citation. Because citation counts weigh heavily in decisions regarding hiring, tenure, and salary, these findings have important implications for academic careers. The preliminary findings of a recent study by Heather Sarsons indicate that women tend to be penalized for their collaborative research with men. Sarsons found that while male economists get tenure 75% of the time regardless of whether the majority of their research is single-authored or collaboratively-authored; meanwhile, women who co-author most of their papers only get tenure about 50% of the time. Men receive more credit for collaborative research with women than women receive for collaborative research with men. This evidence of bias seems to disappear when women collaborate with other women. The authors of the study, Sarah-Jane Leslie, Andrei Cimpian, Meredith Meyer, and Edward Freeland, found that women and African Americans are significantly underrepresented in academic fields that are culturally understood to require “brilliance” or “raw talent.” This large-scale, nationwide study of academics from 30 disciplines found evidence of this trend, which the authors name the “field-specific ability beliefs hypothesis.” Fields with a greater belief in the natural and inherent “brilliance” required for research (philosophy, math, physics, music composition) had a far lower percentage of female PhDs. In this study, Andrew Kahn and Rebecca Onion compiled a data set from the Publisher’s Market Database and the list of presses exhibited at the Organization of American Historians. Their analysis found that 75.8% of bestselling popular history books were authored by men and that a similar disparity exists among university press publications. Their work confirms earlier findings by Robert B. Townsend that women are underrepresented in academic history departments (see “What the Data Tells Us about Women Historians”). Not only are men writing history, but also they are writing the histories of men, determining the narratives through which we understand the present and the possibilities for the future. When asked who is the smartest in the class, male biology students consistently ranked male students as more intelligent than better-performing female students. Through social network analysis, Daniel Z. Grunspan, Sarah L. Eddy, Sara E. Brownell, Benjamin L. Wiggins, Alison J. Crowe, and Steven M. Goodreau found that male students are more likely than female students to be perceived as knowledgeable about course content, especially by other male students. Among the 1,700 students surveyed in three introductory biology classes, female students nominated their peers equitably, while male students consistently ranked other male students as more intelligent than their female peers. Even after controlling for class performance and outspokenness, this bias increased over the course of the term. In this forthcoming research, Jeff Colgan explores the gender bias evident in International Relations syllabi. This research is drawn from a larger scholarly project on graduate training that analyzes a dataset of 3,343 required readings assigned in the core International Relations course at 42 U.S. universities. According to Colgan, “the data suggest that 82 percent of assigned readings in IR proseminars are written by all-male authors,” a percentage that is high, but “roughly consistent with the gender pattern of articles published in top IR journals.” Using a larger data set, Colgan found that female instructors assign 36% more readings by women, though they were also more reluctant than their male colleagues to assign their own work. Colgan concludes with a call for those teaching PhD courses in International Relations to consider how their syllabi will appear to women and minority students. This study by Stephen Buck and Drew Tiene explored the impact of teachers’ attractiveness, gender, and teaching philosophy, and the interaction of these factors on students’ evaluations of them. They found that while attractiveness alone did not affect college seniors’ ratings of teacher effectiveness, it had an effect in combination with other factors such as gender and teaching style. Most notably, “the attractive authoritarian female was rated significantly more positively than the other three types of authoritarian teachers” on several scales, including overall competence. Their findings suggest that gender may influence the type of authority image that a teacher projects. While attractive female instructors who use authoritarian teaching methods may be rated more highly, they may also have more difficulty exercising authority in the classroom, which the authors suggest would have implications for teacher training and evaluation. In this article, Courtney E. Grasser and Katharine S. Shaffer demonstrate how resources such as counseling and mentoring can help address the leaky pipeline of women in higher education: the trend of women prematurely leaving academia. The article includes an extensive literature review of studies on female academics’ experiences related to career development, pipeline influences, and pipeline outcomes. By analyzing the experiences of women academics before, during, and after their faculty appointments, they provide insights to assist in career counseling. Their research demonstrates “that there are inherent systemic disadvantages for women in academic fields, which contribute to the leaks during each stage of the academic pipeline” (346). In this study, Romy van der Lee and Naomi Ellemers analyzed the application and review materials to three calls for a prestigious grant for personal research funding for early career scientists awarded by the Netherlands Organization for Scientific Research (NWO). The anonymized data covered the years 2010-2012. Their results “reveal gender bias favoring male applicants over female applicants in the prioritization of their ‘quality of researcher’ (but not ‘quality of proposal’) evaluations and success rates, as well as in the language use in instructional and evaluation materials.” Interestingly, gender disparities were most pronounced “in scientific disciplines in which female applicants were more visibly present and larger numbers of applications had to be processed (i.e. life sciences and social sciences).” In addition, researchers’ track records seem particularly prone to gender bias. Based on this research, the authors recommend “review procedures with an exclusive focus on the research proposal” to mitigate the effects of gender bias in applications for research funding. In December 2015, Casper J. Albers published “Dutch research funding, gender bias, and Simpson’s paradox,” attempting to discredit their findings based on what he claimed was an inappropriate statistical procedure and the statistical error known as “Simpson’s paradox.” However, in their December 2015 “Reply to Albers: Acceptance of empirical evidence for gender disparities in Dutch research funding” van der Lee and Ellemers affirm their conclusion “that applicant gender contributes to early career funding success,” reiterating that their study considered the “uneven distributions of awarding rates within disciplines.” They demonstrate that Simpson’s paradox cannot explain why fewer women than men are selected for advanced phases of the review procedure and that “these disparities are most clearly visible in the disciplines with a relatively high proportion of female applicants.” In addition, they note that Albers’ response is similar to that of other recent research that reveals a reluctance among scholars to accept empirical evidence demonstrating implicit gender bias in science (Handley et al., “Quality of evidence revealing subtle gender biases in science is in the eye of the beholder” included in this bibliography under “Men in STEM deem research on gender bias as less meritorious”). This study by Ian M. Handley, Elizabeth R. Brown, Corinne A. Moss-Racusin, and Jessi L. Smith examined how receptive public and academic communities are to experimental research revealing gender bias in science, technology, engineering, and mathematics (STEM) fields. The authors conducted three randomized, double blind experiments in which participants—some from academic communities and others from the general public—read an actual journal abstract reporting gender bias in a STEM context and evaluated the overall quality of the research. They found that men are less receptive to this research than women: that men rate the quality of this research as less meritorious. This research, they argue, suggests “a relative reluctance among men, especially faculty men within STEM, to accept evidence of gender biases in STEM.” This additional layer of bias against research documenting gender bias should be considered in efforts to diversify those working in STEM. This study by Patti Miles and Deanna House analyzes 30,000 student evaluations of 255 professors spanning six semesters during a three-year period. The authors found that while “women seem to be competitive with their male colleagues on many levels…when it comes to teaching large classes their scores on STEs seem to drop substantially” (123). They urge educators and administrators not to rely solely on student evaluations to measure teacher effectiveness, and to utilize this information in conjunction with other methods. This study explored why women constitute 77% of students at public visual arts academies in Poland, but only 22% of professors. In order to better understand the dearth of women in art academies, the team of researchers used both qualitative and quantitative methods, including a survey on a sample of 783 students at nine visual arts academies and interviews with 32 employees and students from four selected academies. In particular, they analyzed student aspirations, priorities, and strategies; psychological factors; and student-professor relationships. Their research found that “more men see working at a university as an attractive career option” (53) and that the well-being of female students declined during their time in visual art school. The authors suggest that “the low ratio of female teachers in art schools might be related to the hermetic nature of the art community with very unequal distribution of informal career incentives between the two sexes” (58). Especially in a field like visual art, which, as the authors note, requires diversity both for justice and creativity, it is urgent to address these systematic inequalities and increase the number of female professors in public visual arts schools. This study by Anne Boring, Kellie Ottoboni, and Philip B. Stark found that “in two different universities and in a broad range of course topics, SET (student evaluations of teaching) measure students’ gender biases better than they measure the instructor’s teaching effectiveness.” Based on their analysis of two data sets, they found that 1) student teaching evaluations are biased against female instructors by an amount that is large and statistically significant 2) this bias affects how students’ assignments are graded 3) the bias varies by discipline and by student gender 4) it is not possible to adjust for the bias, which depends on many factors 5) student teaching evaluations are more sensitive to students’ gender biases and grade expectations than teaching effectiveness and 6) gender biases can be large enough to cause more effective instructors to get lower evaluations. This article by Andrew Piper and Chad Wellmon primarily addresses the unequal concentration of elite institutions within prominent humanities journals, demonstrating “a strong bias towards a few elite institutions who exercise outsized influence not only on who gets tenure-track jobs but also in who gets published and where.” The article also includes a section on gender. Their publication data focuses on four major humanities journals — Critical Inquiry, New Literary History, PMLA, and Representations — and a larger set of 20 humanities publications. They found that “gender equality in academic journals is moving slowly toward parity, though not universally across the field nor is the process close to completion” (16). Interestingly, their findings suggest that “academic publishing is moving faster than public venues such as book reviews to be more inclusive towards women” (16). Read Andrew Piper’s announcement of the article here. A number of papers appearing in 2014 and 2015 make the claim that gender bias does not exist in certain areas of STEM hiring practices or that cultural factors rather than bias are the cause of lack of representation of women in STEM fields. This study by Stephen J. Ceci, Donna K. Ginther, Shulamit Kahn, and Wendy M. Williams explored the underrepresentation of women in college majors, graduate school programs, and the professoriate in fields that are the most mathematically intensive (geoscience, engineering, economics, mathematics/computer science, and the physical sciences). They found that “gender differences in attitudes toward and expectations about math careers and ability (controlling for actual ability) are evident by kindergarten and increase thereafter” (75). They conclude that pre-college factors, more so than gender discrimination in higher education, best account for women’s underrepresentation in math-intensive STEM fields. According to the authors, “the most significant implication of our analysis is that failure to acknowledge the nature, complexity, and timing of causes limits progress in increasing women’s representation in math-intensive careers, by directing resources to areas that are not currently major reasons for the dearth of women in math-intensive fields” (128). They conclude by emphasizing that the causes of women’s underrepresentation in math-intensive fields are complex and cannot be attributed to a single factor such as gender bias. They issue a call for further research. This study by David I. Miller and Jonathan Wai interrogates the accuracy of the “leaky pipeline” metaphor for understanding why women are underrepresented in STEM fields. The “leaky pipeline” describes how “women are more likely than men to leave science at multiple time points from the beginning of college through academic tenure” (1). Using retrospective longitudinal analysis and data from the National Survey of College Graduates and the Survey of Doctoral Recipients, this study analyzed STEM persistence: the percentage of students who earned a Ph.D. in a particular STEM field among students who had earlier received bachelor’s degrees in the same field. According to their findings, the leaky pipeline metaphor only “partially explains historical gender differences in the U.S., but no longer describes current gender differences in the bachelor’s to Ph.D. transition in STEM” (1). Instead, their research suggests that “women and men are equally likely to later earn STEM Ph.D.’s after the bachelor’s” (9). Given these findings, they argue that in order to better understand women’s representation in STEM at the Ph.D. level and above, we need to look at gender differences at the bachelor’s level and below. This study by Stephen J. Ceci and Wendy M. Williams reports the findings of five hiring experiments, in which faculty members evaluated narrative summaries describing hypothetical female and male applicants for tenure-track assistant professorships in biology, engineering, economics, and psychology. The studies compared the likelihood that faculty members would select applicants of one gender rather than another, given applications of the same high quality level. According to the authors, “Results revealed a 2:1 preference for women faculty of both genders across both math-intensive and non-math-intensive fields, with the single exception of male economists, who showed no gender preference” (5360). The authors argue that this work complicates extant research on antifemale bias in hiring practices in STEM. Drawing on research on actual hiring practices, they argue that “actual hiring shows female Ph.D.s are disproportionately less likely to apply for tenure-track positions, but if they do apply, they are more likely to be hired” (5365). The authors of the study hope that it will encourage women to apply for tenure-track positions and thus improve gender parity in STEM fields. In this study, Stephen J. Ceci and Wendy M. Williams asked 694 faculty members to rank three finalists for a tenure-track position in their department. Two sets of materials were used. The first contained profiles of two male applicants with identical scholarly qualitative scores (9.5 out of 10) on the basis of scholarly accomplishments, job talk, and faculty meetings (but with differing narrative descriptions of their personalities) and a third female applicant who was given a score of 9.3 out of 10. The second set of materials reversed these genders so that the two more highly pre-ranked applicants were depicted as women, and the third lower ranked applicant was depicted as a man. The authors found that the more accomplished candidates were preferred overall, regardless of gender, leading them to conclude that “the most prudent interpretation of the present results is that exceptionally strong candidates of both genders are unlikely to face gender discrimination” (7). This study by Samuel F. Way, Daniel B. Larremore, and Aaron Clauset sought to better understand why women are so dramatically underrepresented in computer science, comprising only 15% of the professoriate. Using data on hiring outcomes and scholarly productivity for 2659 tenure-track faculty across 205 Ph.D.-granting departments in North America, they found that hiring outcomes are most directly affected by 1) the relative prestige of hiring and placing institutions and 2) the scholarly productivity of the candidates. According to the authors, gender does seem to play a significant role in scholarly productivity, postdoctoral training rates, and career movements up the rankings of universities. They also found that highly ranked departments more actively recruit female faculty at higher than expected rates which appeared to inhibit similar efforts by lower ranked departments. They predict that it will take sixty years to achieve gender parity in computer science, and that this process should be expedited to further social justice and increase scientific innovation, creativity, and productivity. How do you work to better structure equality in academia? Let us know in the comments section! 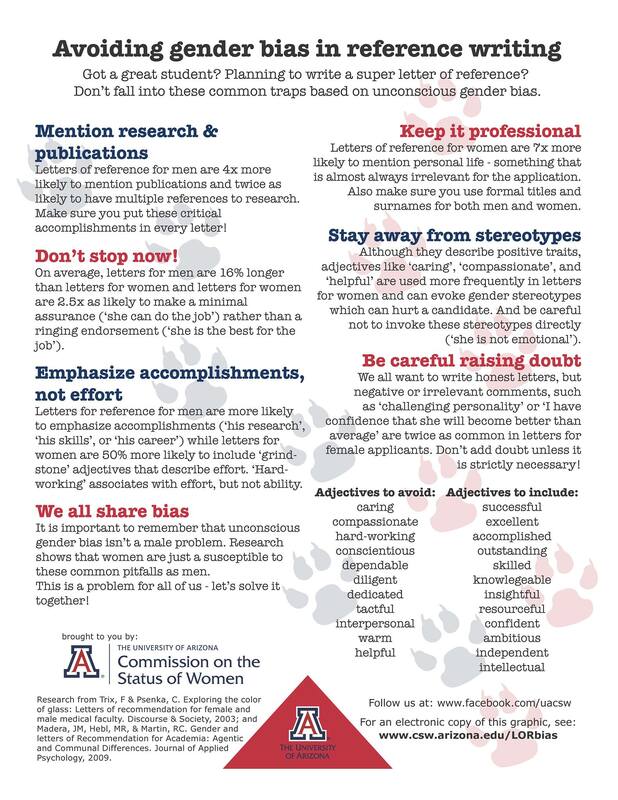 Suggestions for avoiding gender bias in letters of recommendation, produced by the University of Arizona Commission on the Status of Women. NEW: Disrupting the Culture of Silence, edited by Kris De Welde and Andi Stepnick, explores the obstacles faced by female faculty, and is designed as a toolkit for greater gender equity in higher education. This piece first appeared on the HASTAC blog and is reposted with the authors’ permission. Academic research plays an important role in helping to shape a more equal society. Especially it is up to the point today when there is so many fields to be involved in for both genders. I am surprised to find some of the most high-profile studies of the recent years missing, especially Williams and Ceci (2015) and van der Lee and Ellemers (2015), as well as Albers’ (2015) important re-analysis of the latter study. Is there a reason for this omission? at least we can now say all this gender bias in academia isn’t doing men much good lol. women in the US are now much more likely to attend college, much more likely to graduate college, more likely to pursue graduate education, and much more likely to complete post-graduate degrees than men.